S. – There are so many wonderful elements to this film it is difficult to know where to begin. Such a small-scale domestic drama rests heavily on the performances of the key characters, and here they are amazing indeed. Just as crucial is the ability to render a home environment both ordinary and compelling. Ozu weaves both of these threads together seamlessly turning the everyday life in the Somiya household into an engaging study of family dynamics. In particular I enjoy the way the indoor scenes are shot. The camera tends to be low to the ground, even when people are walking around a room, although they eventually settle on the floor coming perfectly into frame. Frequently there will be a couple of points of view during a scene yet we are only treated to each camera angle once, for an extended take, resulting in a main character having their back in the shot, leaving us to focus on the other person as they interact with an unseen face. It lends an intimacy to the conversation as you are drawn into the actions and reactions of just one character at a time. In a strange way it reminds me of the situation where you can only hear one side of a phone conversation, somehow the person’s voice attracts your attention more when you are not getting all of the information. J. – Ozu’s settings are remarkable, particularly during the indoor scenes. There is nothing particularly flashy or interesting about his sets, but you can tell that everything in these rooms is exactly where it should be. That in and of itself is not so unique, there are a lot of filmmakers who create perfect dollhouse-type worlds (Wes Anderson springs to mind), but Ozu’s settings are both perfect and utterly ordinary. They feel real and lived in, but no less compelling for all that. That is certainly highlighted in part because of the low placement of the camera that you mentioned — keeping it tatami mat level for Japanese players who tend to sit on the ground. But what I find interesting is that Ozu keeps the camera at ground level even in scenes when characters are standing or sitting in chairs, it gives a different flavor to scenes while basically keeping the camera static. But more than that, the director constantly breaks the basic rules of constructing scenes — particularly dialogue scenes. We are all familiar with how conversations between two people are generally handled in movies — master shot at a distance and then a switch to over-the-shoulder views showing each person speak in turn. It’s the most basic language of cinema, but it’s not how Ozu operates in Late Spring. A scene will often be established with a master shot, but as you mentioned it isn’t unusual for one of the key players to have their back to the camera. And then rather than doing over-the-shoulder shots the camera will often go to a first person perspective, the actor talking directly to the camera and the audience sitting as a substitute for the other person in the conversation. And then it might switch to a new master shot that is from the opposite side of the room, 180 degrees from the original camera position — a trick basically nobody else uses. It works incredibly well, adding a certain dynamism to scenes that are really just two people chatting in a normal room and also injecting the viewer directly into the conversation by having the performers speak directly at the audience. But it would be easy for this semi-fourth-wall-breaking to feel gimmicky or to pull the audience right out of the reality of the film if you didn’t have performances that feel grounded and true to life. Late Spring, thankfully, is blessed with some absolutely stellar acting across the board. This selection of successive shots illustrates the manner in which Ozu handles many scenes. The establishing shot contains both characters seated at the table, as they converse the camera becomes each of the characters in turn, taking in what their conversation partner is saying. When Ozu returns to a wider shot, it is from the other side of the room, directly opposite the location of the first establishing shot. Cutting the conversation this way allows the director to keep the camera still — perfect for a quite domestic setting — but still keep the action interesting and engaging. 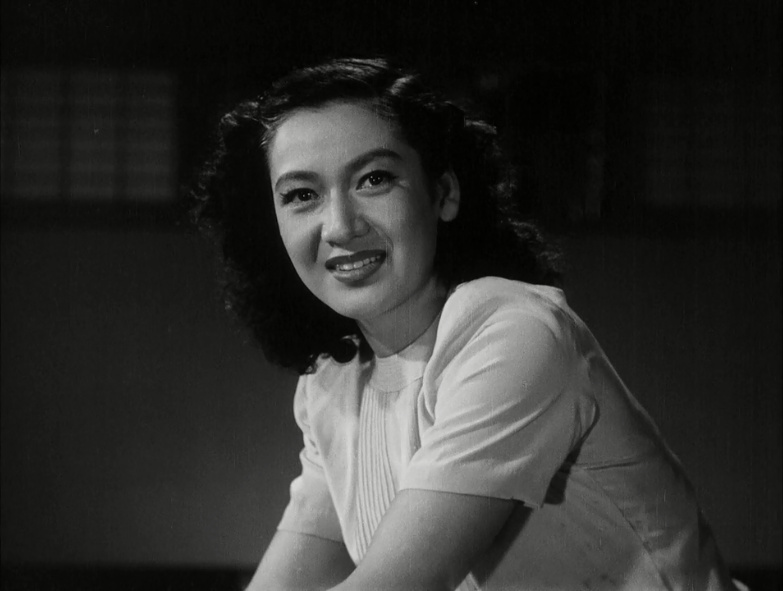 S. – Setsuko Hara as Noriko is absolutely radiant. She has a magnetic screen presence as a carefree and devoted daughter running the household for her father. From all outward appearances Nori is perfectly satisfied with her life, even though the fact that she is in her late twenties and shows no desire to marry is beginning to concern to her aunt and her friend. Small hints at the complexity that exists within Nori’s pleasant and easy nature are skillfully conveyed by Setsuko as her family members conspire to push her out of her arrested development. Ozu is a master at “show don’t tell” and the sensitivity of a performance such as Hara’s executes the fragile emotions at play vividly, yet with a light touch. Alongside her Chishu Ryu is perfect as a gruff yet loving father. He is so very likable and the father-daughter dynamic, especially as it shifts from parent and child to adult and adult, feels genuine. The scene where he is keen for Nori to have a heart-to-heart talk with her more worldly girlfriend is a perfect example. He brings clumsily prepared tea to Nori’s sitting room before making it clear he is off to bed, thinking he is giving events a subtle nudge in the right direction but inadvertently reinforcing Nori’s belief that he is pretty useless around the house without her. All the action takes place with either one or both of Setsuko or Chishu on screen, which is I huge factor in why I like this film so much. Late Spring was the first of many Ozu movies to feature Setsuko Haru, an actress of rare warmth and vulnerability. It seems criminal that she isn’t world famous for her performances in films like this one and Tokyo Story. J. – Not to jump ahead, but since we’ve already seen Ozu’s highest ranked list film, Tokyo Story (1953), we already knew that Setsuko Hara was a fine performer. But even with that film already under my belt, she truly surpassed all of my expectations in this film. It’s not so much that she nails the ends of the emotional spectrum — although she does, her moments of deep sadness are palpable but her moments of joy are equally infectious. No, it’s her remarkable ability to explore the more minute and less easily transmitted emotions between those two extremes. There’s such great subtlety to her portrayal of Noriko — a woman who is perhaps not so much happy in her current life as fearful of change. That constant tension in the character’s life comes through in the performance, with a certain melancholy hovering around the edges of the performance even when Noriko is at her most energetic and personable. Chishu Ryu is nearly as engaging in the role of the father. There is something special about his work in this film that makes him a strangely comforting presence on the screen — you feel a bit better just by sharing a seat on the floor with him. It’s a very subdued performance — not requiring the overt emotional swings that Noriko goes through — but Chichu packs a world of feeling into his silences and gentle confusion. This is a movie where most of the emotional beats lie in what’s not said. Noriko basically stays mute when confronted with the urging of her super modern friend and her aunt (Yumeji Tsukioka and Sugimura Haruko, respectively, both turning in excellent comic performances). And even when Noriko and her father finally talk about matters plainly, they speak in platitudes and essentially leave matters unresolved. It is a great strength of Late Spring that it doesn’t have its principal characters readily give voice to their deepest concerns. The movie gives leave for the audience to interpret the actions and emotions of the players, which allows for a deeper investment in their struggles. I believe the extensive use of silence in the film is key to drawing the viewer and keeping the movie emotionally rich. I think particularly to a remarkable seen in a Noh theater where father and daughter sit together watching the performance. The arrhythmic music and stylized acting of the performance create a mood of strange tension, and Ozu sticks with the performance for several uninterrupted minutes. I actually got to the point where I was actively wondering why the camera had zeroed in on the stage performance for so long, but then Noriko’s father nods to a woman whom Noriko believes he intends to marry. Noriko bows her head, looks between her father and the woman across the room, and is overcome with sadness at the idea of her father remarrying. Noriko’s turmoil is dragged out by the film during this scene and all of a sudden the focus on the Noh play makes sense: the droning music and vocalizing plays perfectly with the character’s inner struggle, and the scene would have been far less powerful had the time not been taken to establish the mood of the room. This is not an isolated scene in its ability to establish mood through place and setting. What’s so remarkable is that the movie consistently manages to have everything feel so perfectly placed, so tightly controlled but still be wracked but a tumultuous undercurrent that feels natural and lived in. 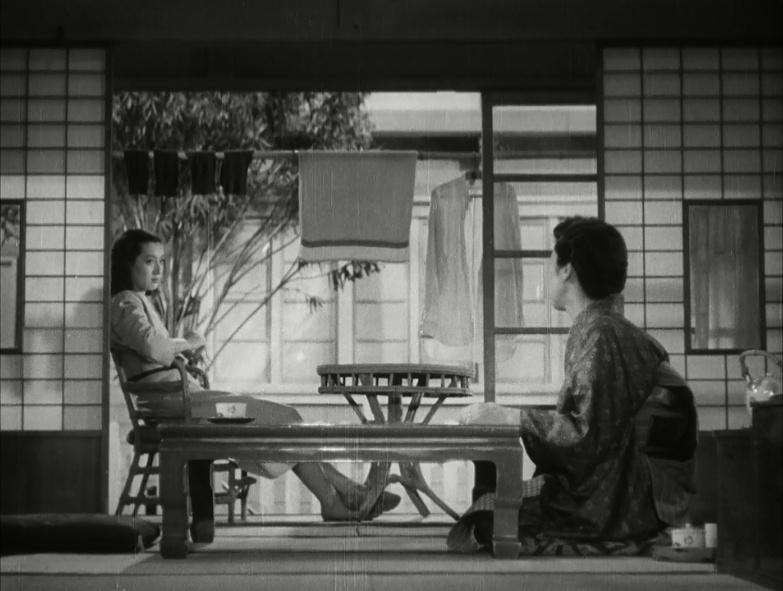 This shot shows Ozu’s ability to have ordinary sets that still feel like perfectly crafted little worlds of their own. But that said, the tension between Noriko and her aunt is palpable even in this still — the turbulence of the real always manages to manifest amongst the precision of the setting. S. – There is a deliberateness to each scene that is unmistakable. In lesser hands the unusual camera placement within a room and extended shots might seem like a gimmick, but here it has a steadying effect that invites you to see everything important that happens. Ozu earns the viewers trust, even when things do seem to be going off at a tangent (that was quite a lot of Noh) there is a payoff delivered. 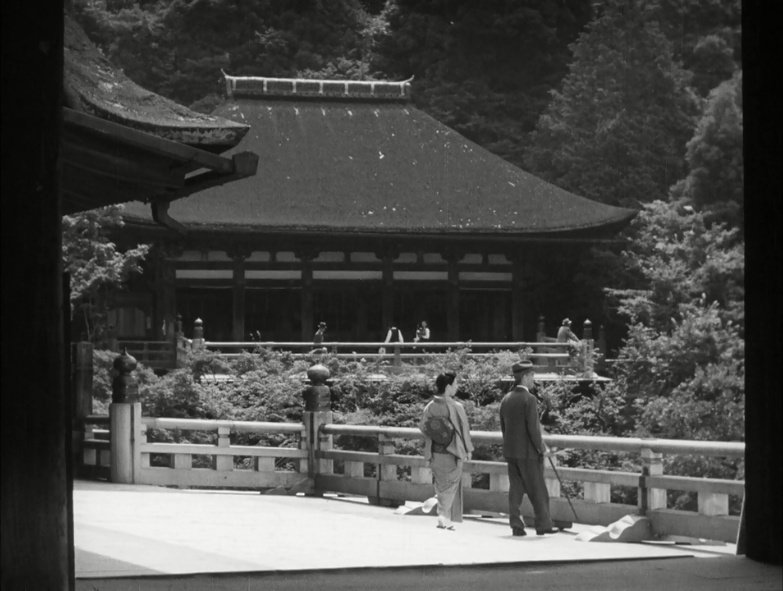 We’ve made particular mention of the indoor sets in Late Spring, but Ozu also does a compelling job with outdoor settings, letting a measure of grandeur — and some moving camera shots — seep into the story. J. – It’s very hard to take away a clear message from Late Spring. In many respects it feels like a movie of deep contradictions, many of which can’t be resolved in any concrete fashion. You mention the sympathetic portrayal of Masa, the divorcee, but I wonder if you would have even registered that sympathy if this wasn’t such a deeply conservative film at times. If it was a modern, forward-looking exercise then that attitude toward an independent, divorced woman would have been wholly expected, but Late Spring often feels like it is steeped in a nostalgia for the glories of Japan’s traditional past. While the family clearly loves Masa and her company, there is also a certain flightiness to the character, and her Western-style home, while simple, feels jarring in the context of this film. So while the portrayal never makes Masa out to be lesser or unvirtuous, it is not wholly in her favor. But for all the looking back the film never appears to wallow in nostalgia. I think to the conversation between the father and the aunt in which they gently grumble about young folk these days but then go on to express concern that Noriko is too much like a person of the old generation. I suppose, however, that this vacillating attitude makes sense in a Japan that was being forced to cast off a lot of its past to finda new place on the world stage — after all, this film was made during the American occupation after WWII. But for all the competing — and unresolved — views of Japanese society that the film presents it never feels unsure of itself. Rather you get the impression that a profound, if quiet, argument is unfolding throughout the movie — one that is given form and stability by the film’s gentle tone and intense focus on the feelings of individuals. You can see the social forces at play seeking to control the life of Noriko, but the movie only ever hints at there being a greater Japan beyond these few characters — even Noriko’s husband-to-be never makes an onscreen appearance. And because the film stays so firmly rooted in these well-defined characters and their competing points of view, it becomes harder to know exactly what is truly being proposed. I present as an example the central issue of the film — the need for Noriko to get married. You get the distinct feeling that the film is not in favor of forcing anyone to marry — that this is an outmoded practice that women should not have to put up with. But by the same token, Noriko has problems — she really needs to leave the nest and forge a life of her own. She needs to become an adult and not her father’s housekeeper. And while the people pressing Noriko to marry may be wrong, they are all absolutely doing so from a place of absolute love and concern for her. I’m at a loss as to say what that all means, but I think that is why the film is so successful. It refuses to be pat or preachy; it would rather explore the emotional consequences of the characters’ actions in relative isolation from the larger world. At the risk of sounding pat myself, I would say that Late Spring is a movie that is more sensibility than sense. The father-daughter dynamic in this film is handled so superbly and with such sensitivity that the film easily transcends the plotting, which goes over some seriously well-worn territory. S. – The freshness of what should be a tired topic is truly remarkable. The marriage plot is always presented as a step into adulthood, rather than as simply a women’s duty. You get the sense that everyone is rooting for Noriko to be brave enough to step out into the world. The very forthright Masa tells Nori that she should go for an arranged marriage as she is too shy to find a husband herself and if it doesn’t work out she can always get divorced. The message very clearly is that it is time to get on with her life. Late Spring doesn’t give much away on either side of its timeline. There is a hint of a past illness and the general turmoil caused by the war as the reason Nori has stayed so long at home, and, as you mentioned, J., the proposed spouse is of so little consequence that we never see him (although he is rumoured to resemble Gary Cooper [J. – only around the mouth!]). 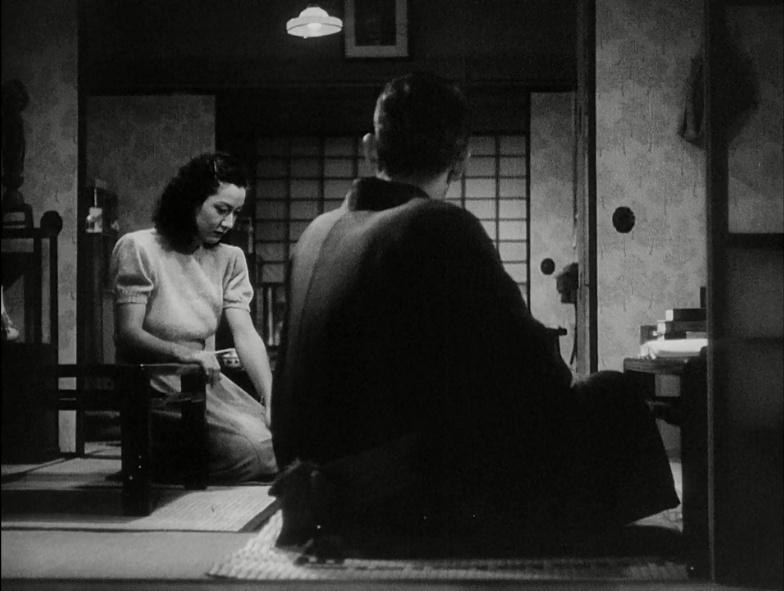 Just like Ozu’s visual framing the viewer is kept tightly focussed on what is happening in a very small space. Of the many aspects that I enjoyed about this film it is the exploration of a father’s love for his daughter above and beyond the social expectations of the time and place that brings the real substance. The awkward conversations and mixed emotions of having to let go of the things you hold dear were realised with delicacy and insight. And most importantly Ozu trusts the viewer to engage with the vision he creates.